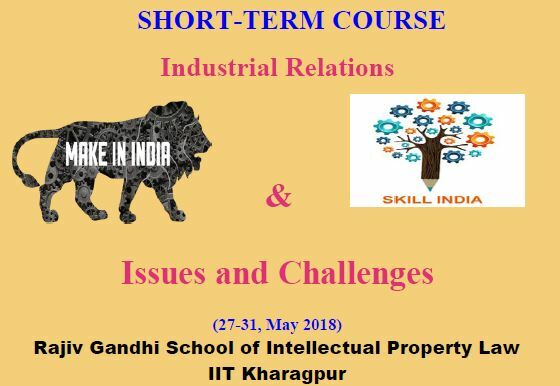 A Short Term Course on Industrial Relation, Make in India & Skill India – Issues and Challenges will be held between 27-31, May 2018 by Rajiv Gandhi School of Intellectual Property Law, IIT Kharagpur. The vision of ‘Make in India’ promises to make the country a manufacturing hub and to employ adequately skilled workforce in different manufacturing industries. The policies to attract investment and to train the workforce to meet the demands of the industries need to be aligned with the vision laid out by the Government of India. Laws relating to industrial relations will play a vital role in ensuring success of the vision as the archaic labour laws which are considered an impediment to output growth and employment generation in the labour intensive manufacturing sector. Both the central government and the state governments are conferred with the jurisdiction to realign the labour laws so that the capital and labour gets equal attention in the implementation of ‘Make in India’. brought in the change to attract industry in their territory. Other than labour reforms, making its young demography job-ready is equally important for the success of Make in India. Inadequateness of skills erodes the competitiveness of an economy and affects productivity. On utilizing human capital, India is a best example of ‘scarcity amongst plenty’. There is a growing mismatch between the requirements of the industry and skilled manpower. The much required emphasis on skill development will give necessary flexibility to employers as well as to employees. The employer will have necessary leeway to recruit as when situation warrants and the employee will have a better prospect of jobs across the industry. In the light of this, the course aims to addresses the issues of ‘Make in India’ and ‘Skill India’ in the context labour laws related to industrial disputes, retrenchment, social security etc. To analyze the relationship between ‘Make in India’, ‘Skill India and ‘Industrial Relations’. To study the provisions related to industrial and labour laws which impact the vision of ‘Make in India’ and ‘Skill India’. To examine the proposed changes and policy formulated on industrial and labour laws in relation to ‘Make in India’ and ‘Skill India’. Who can apply: Students, Practitioners, Researchers and Personnel from Industry and Academics. How to apply: Participants can download the form given here and send the filled in form to [email protected]. Course fees: No course fees for faculty of AICTE approved institute. Participants will be provided certificates on successful completion of the programme. Accommodation and lodging and food will be provided to AICTE candidates. Others can avail the same on self-finance basis.